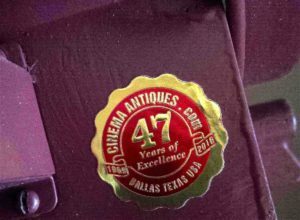 We offer The Best Antique’s Guarantee ANYWHERE! At Cinema Antiques, we are committed to building a long-term, rewarding relationship with each and every client. When you buy antiques from Cinema Antiques you can do so with complete confidence. We are so confident that our antiques are some of the finest in the world, that we back each piece we sell with a 100% One Year guarantee. 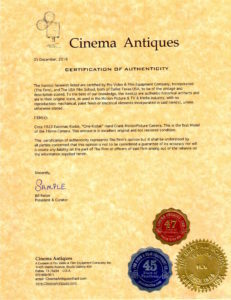 Any antique you buy from Cinema Antiques can be returned by you, within one year from the date of original purchase, in the exact same condition as when you originally purchased it from Cinema Antiques, for a 100% full credit on any like kind of antique available item(s) in our owned gallery, catalog or web site at the published retail price. This Guarantee and any associated items exchanged are and will be subject to any changes in federal and state laws and regulations, including those relating taxes, domestic and international regulations and bans and tariffs as well as any changes in our policies. All shipping, packing, crating, insurance and delivery costs involved in this guarantee, are to be at the cost of and the responsibility of the client.